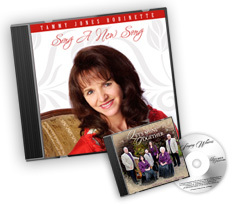 “We received our CDs and promotional material and couldn’t be any more pleased. I loved the communication we had. When I turned in our graphics, DOVE called us and advised that the pictures we turned in most likely would not look good due to a size issue. I found this to be excellent! We had the same issue with another company, EVEN PAID MORE TO HAVE THEM CHECK IT, and they sent us the CDs back with graphics looking like we made them ourselves with a $19 printer. “I just received my CDs yesterday and I wanted to let you know that once again, they are GREAT!!! I did not expect them so soon but hey, that’s the way I like it. Working with [the staff] is really a pleasure. I can always depend on straight answers to my questions and everyone seems to possess the desire to go the extra creative mile to make every project special. You continue to exceed my expectations and I am grateful. FREE graphic design, creating an impressive professional looking color insert and trayliner. With Orders of 100 Cds or more.